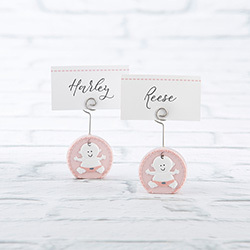 Kate Aspen’s Pink Baby Girl Place Card Holder in a set of 6 is the perfect way to bring a touch of style to your shower right from the start! Each set comes equipped with 6 matching cardstock place cards, so your holders are ready to use when you need them. 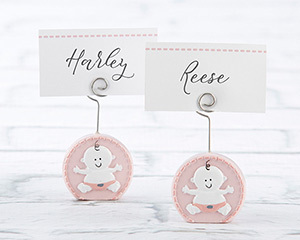 Made from resin, the place card holders are built to last as cute baby shower souvenirs as well! 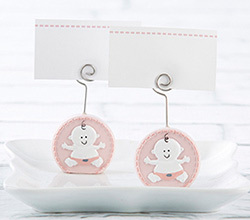 Round resin baby pink place card holder with white and pink cardstock place card.